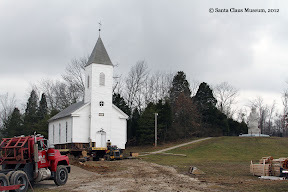 A light dusting of snow and a brisk winter’s chill couldn’t deter the MCF House Movers crew from rolling our historic 1880 German Evangelical St. Paul’s Church to its new resting spot yesterday. 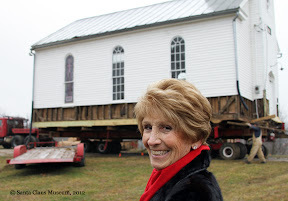 It was a momentous day, not only for the church or museum but also for Mrs. Koch who has dreamed of this happening for years. 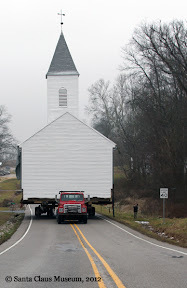 As serious a business it is to move a 132-year old church with 70-foot steeple intact, it didn’t come without some puns. I think the sign on the back of the church says it all! Some people will also be sure to remember February 8, 2012 as one of the few times the town of Santa Claus experienced a traffic jam. There was at least a handful of cars on each side of the roadblock that got a front row seat to what will probably be the widest and tallest load they’ve ever seen trucked down the highway. 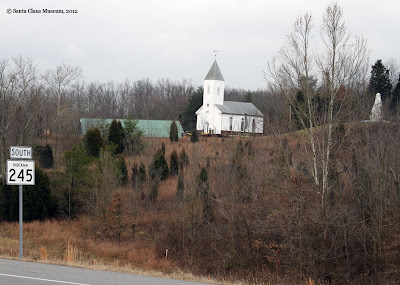 At least the bells didn’t ring the entire time our picturesque church was on the move. Crews made sure to tie it off before it started rolling, less the entire town and every animal in a 5-mile radius be alerted to the madness. 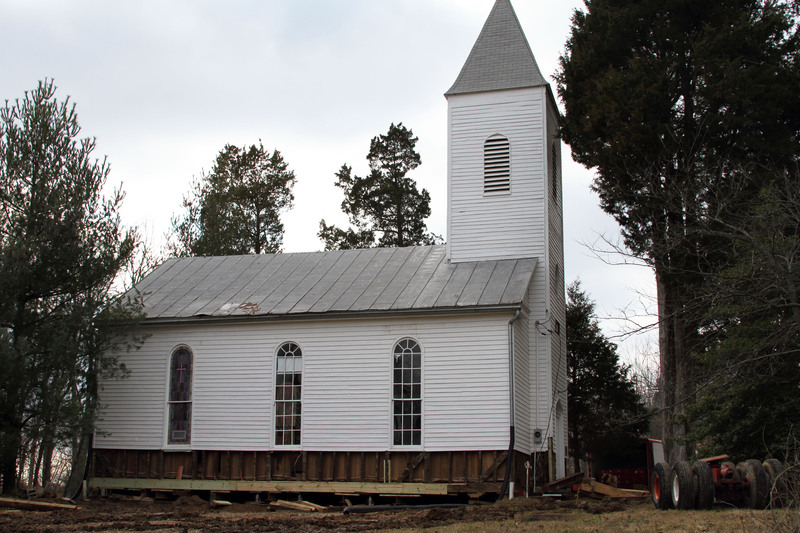 The 1880 church gets ready to rest on its new foundation. Ron Smith, general contractor on the project, watches the church inch the final few feet toward the new foundation. In case you missed all the fun, we shot some video for you so you can see the process. 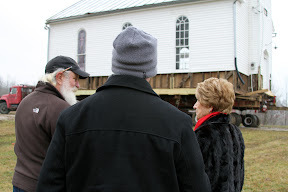 We also talked to Mrs. Koch about her dream (to restore and open this church to the public) finally coming true. On Tuesday the first Santa Claus Post Office will roll around the corner from Holiday World & Splashin’ Safari to the Santa Claus Museum & Park. There it will join the church and Historic 1935 Santa Claus Statue. *If you’d like to make a donation to help the museum continue preservation efforts of these two buildings and many other important objects, please visit our Members & Support page where you can now donate online via PayPal.